Credit: NASA. Download this image (JPG, 65.8 KB). [18-Oct-16] This image shows average spring ocean chlorophyll concentrations (light green) produced from 1998-2004 data and represents the distribution and abundance of phytoplankton. 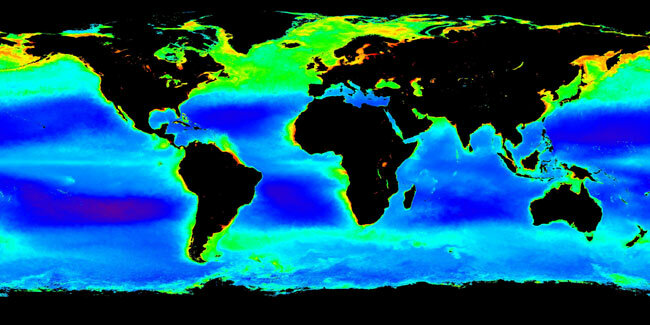 These data show the characteristic bloom of phytoplankton in the North Atlantic. While the magnitude, spatial extent and duration of the bloom depends on a variety of environmental conditions, the annual event can be observed by satellite.